Traveling to cities (especially in the northeast) often comes with a hefty price tag. 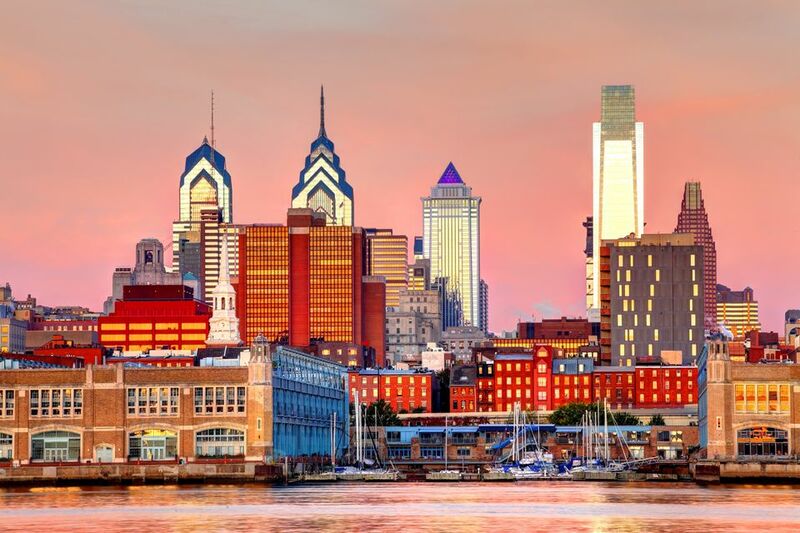 But if you’re heading to Philadelphia on your next vacation, you’re in luck: the City of Brotherly Love is brimming with free attractions that will teach you unique history, indulge your creative side, get you exploring outdoors, immerse you in the arts, and so much more. Here are 15 ways to experience this amazing city at literally no cost. If you’re looking for the quintessential touristy thing to do in Philadelphia, delving into American democracy at Independence Hall and Congress Hall is it. Independence Hall is the birthplace of the Declaration of Independence and the U.S. Constitution—admission is always free, but you’ll need to grab tickets first at the Independence Visitors Center, located on the corner of 6th and Market streets. Also, stop by Congress Hall, which acted as the U.S. Congress’ hub from 1790 to 1800, back when Philly was also acting as America’s temporary capital. And while some say the cracked Liberty Bell is unimpressively small, it’s also free to see and is conveniently located across the way. Ever wondered what that little “P” on the right side of your quarter meant? It means that the quarter was produced at the Philadelphia Mint. Take a free tour of the Philadelphia Mint, one of two U.S. locations responsible for producing coins and medal dies. You’ll view the factory floor from 40 feet above, all while learning about coin design history and manufacturing, minting processes, craftsmanship, and coin striking. Tours take about 45 minutes and are self-guided with no reservations needed; they typically run Monday through Friday 9 a.m. to 4:30 p.m., with a few national holiday exceptions. Head to the Science History Institute for a whole new perspective on how chemistry, technology, alchemy and other sciences have shaped our world. You’ll delve into permanent and rotating exhibits that enlighten visitors about scientific discoveries, trials, and errors over the course of centuries; all for free. You’ll learn fascinating facts and see strange apparatus, rare books, fine art, and multimedia experiences. The museum is open Tuesday through Saturday from 10 a.m. to 5 p.m.
One of America’s most legendary gothic writers, Edgar Allan Poe resided at this address in Philadelphia when he penned some of his most famous works including "The Black Cat." Now a National Historic Site, Poe’s three-story, minimalist abode is open to the public for free tours (self-guided or led by a park ranger). During your visit, you can explore the home, view photos, watch a short informative film, and listen to recorded poetry readings by Poe himself. The site is open Friday through Sunday from 9 a.m. to 12 noon and 1 p.m. to 5 p.m.
Philly Improv Theater offers no-commitment introductory workshops that are perfect for both aspiring comedians and those just looking to have fun and try something new. In these two-hour courses, you’ll learn core improv concepts, how to create characters from thin air, and hone your improvised scene chops — no experience is necessary. Classes are held throughout the week at various times, so check the schedule to sign up. The Barnes Foundation is a French Impressionist art eden, with its new Spring Garden location proudly holding an majestic gallery of masterpieces, including 69 Cézannes (more than in all of France), Renoir, Matisse, Degas, Picasso, early-modern African art, and more. As one of Philly’s top art museums, you’ll definitely want to take advantage of everything they have to offer on the first Sunday of every month: free admission (it’s normally $20), entertainment for the family, and interesting seminars from 10 a.m. until 6 p.m. Free tickets can be obtained at the museum beginning at 9 a.m. for 10 a.m. (and later) entrance times. When visiting the birthplace of America, what could be better than a free five-minute history lesson? Post up at one of the Once Upon A Nation Storytelling Benches stationed around Old City and listen in as uniformed professional storytellers reveal tidbits about American and Philadelphian history. It’s a great educational activity for kids; plus, if they collect a star from all 13 benches, they’ll win a ride on the Parx Liberty carousel. Storytelling is offered from Memorial Day to Labor Day; check the operating schedule for exact times. Summer in Philadelphia means the option for watching flicks alfresco almost every night of the week. Parks and venues all over the city, including Penn’s Landing, The Schmidt’s Commons, the Mann Center, and even the banks of the the Schuylkill River, offer free outdoor screenings of classic flicks and new releases (check each spot’s respective website for show schedules and times). It’s a very popular seasonal activity with locals and visitors alike, so show up early to secure ample blanket and picnic space. Elfreth’s Alley was once the residence of 18th-century tradespeople who worked out of their homes. Fast-forward 300 years, the modern city has popped up around it, but this street remains frozen in time and preserved with its flower boxes, shutters, brick architecture, and cobblestone streets. Most of the 32 homes are still occupied by Philadelphians, making it America’s oldest continuously inhabited residential street; two homes act as a museum that’s open to the public (for a small fee). Elfreth’s Alley is located between North 2nd Street and North Front Street, in the block between Arch and Quarry Streets. Fun fact: In 1736, Benjamin Franklin created America's first fire brigade called the Union Fire Company right here in Philly; the city was also home to our country’s first volunteer fire department. Learn more tidbits about fire history and safety at the Fireman’s Hall Museum, located in a renovated Old City firehouse from 1902. Exhibits include antique fire trucks and gear, memorabilia, and interactive quizzes. The museum is open Tuesday through Saturday (10 a.m. to 4 p.m.) and admission is always free, though donations are welcome. Also known as the “City of Murals,” Philadelphia is home to 3,600 public works of art that unite communities and transform the urban landscape. Mural Arts Philadelphia has put together two self-guided Mural Mile Walking Tours so that visitors may can take in the artistic splendor by foot, free of charge. Mural Mile South takes you south of Market Street to Lombard Street and back along the 13th Street corridor; Mural Mile North will lead you north of Market Street into Old City, through Chinatown, and around City Hall. Download and print the map PDF before you set out. The Curtis Institute of Music hosts an ongoing Students Recital Series in which promising young musicians take the stage and showcase their exceptional talents. This platform also offers the public over 100 opportunities a year to enjoy free two-hour concerts of solo and chamber works. Shows are usually Mondays and Wednesdays at 6:30 p.m., and Friday evenings at 8 p.m., but the calendar is updated with dates throughout the year. Recitals are general admission and first come first serve, so arrive early for the best seats. Enjoying nature within city limits is a lot easier than you’d think. Situated on the banks of the Schuylkill River in West Philly is Bartram’s Garden, North America’s oldest botanical garden. All 102 acres of former farmland offer endless opportunities for discovering the great outdoors, with its lush meadows, green gardens, and river access — and not to mention, amazing views of Philly’s skyline. Bring a picnic, do some birdwatching, or rent paddle boats for free on Saturdays. Grounds are open year-round (save national holidays). It’s always free for the public to play a round at Sedgley Woods, one of the oldest permanent disc golf courses in the world. Located in Fairmount Park, the 27-hole course is open year-round from dawn to dusk. You can rent a disc (for a suggested donation of a dollar or two) or buy your own, and the money from your purchase goes back into caring for the grounds. If you plan on driving, the course has a parking lot on Reservoir Drive, located on the left side if you’re coming from 33rd Street; otherwise, there are ample bike racks for cyclists.